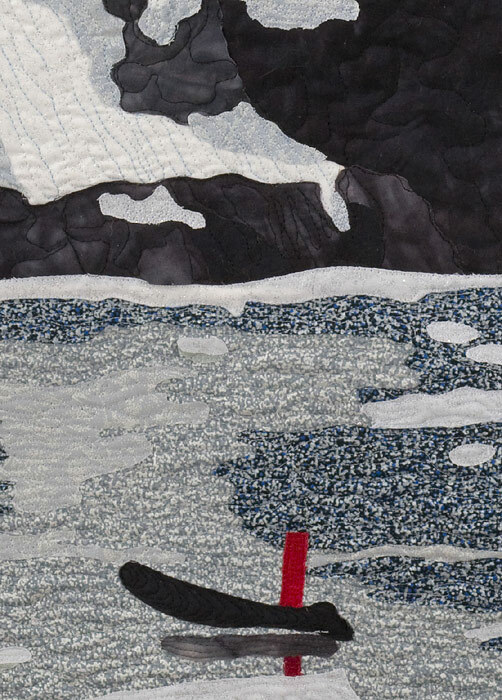 This is a tale of adjusting to the realities of fusing fabric in an intricately layered art quilt. 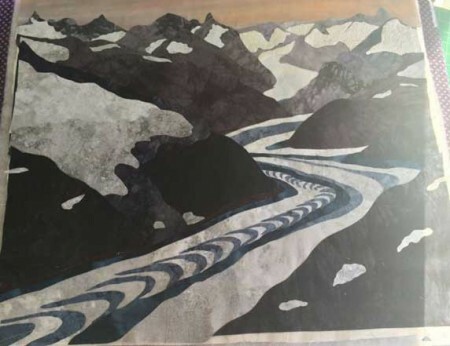 I began working on the piece that I have decided to call Glacial Flow in early January. My first photo of the work has a date of January 7. 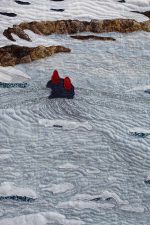 While I have tried experimented with alternative approaches to quilting one of my designs drawn from photos of nature, most often I wait until I have cut fabric for the entire quilt and ‘fused’ the fabric to a muslin background. 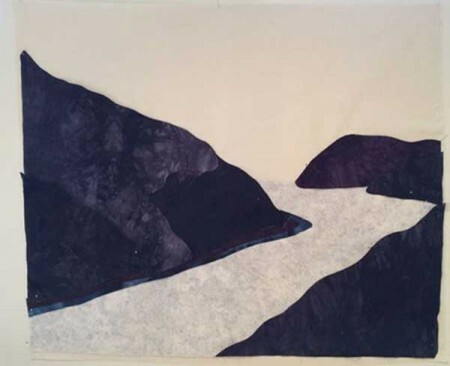 This is the approach that I used in Glacial Flow – which meant that the piece sat/hung in my studio for almost five months. 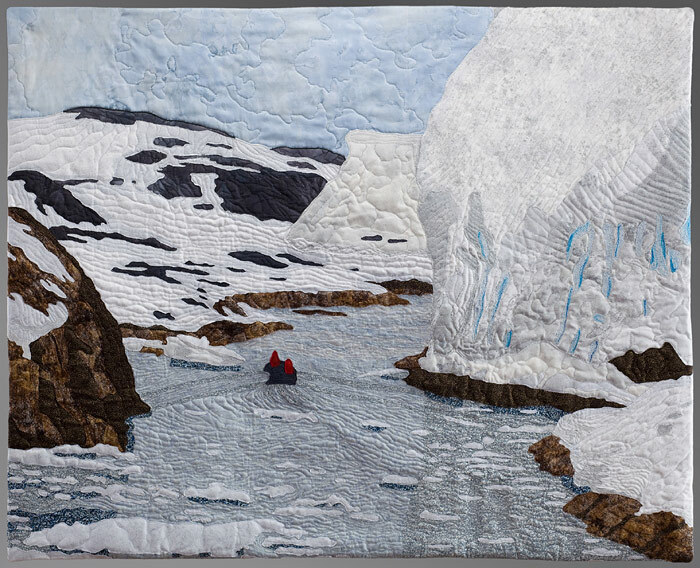 Here is a quick snapshot of Glacial Flow just prior to quilting. You can see there are many layers. I fuse these layers with MistyFuse and normally it holds throughout the quilting process. As you might have guess from the title of this post, Glacial Flow did not choose to behave normally. 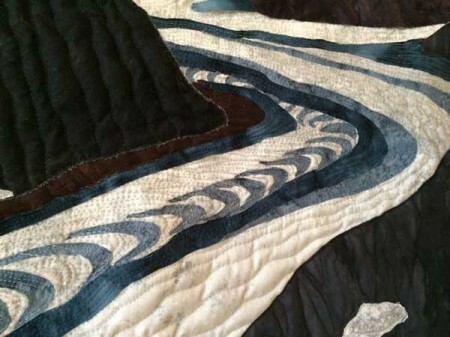 As I began quilting, it quickly became clear that the fusing was not uniformly holding. There are probably a number of contributing factors apart from the length of time from fusing to quilting for the failure of the fusing to hold: I added French Knots to some of the fabric used for snow in the upper portion of the design which created a rougher than usual back surface; my choice of batting was a Quilters Dream wool batting which resulted in quite a bit of ‘loft’. Whatever the reason, it was clear I needed to work with the situation. And, so I did. I decided to use the lack of fusing to my advantage. 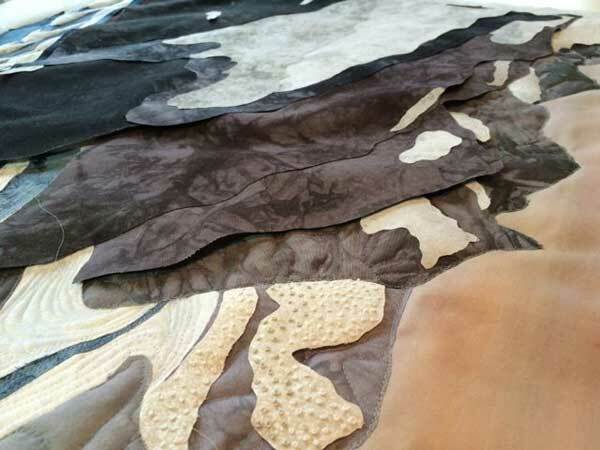 I began to quilt each area in a layered fashion. I used the lack of holding by the fusible to peel back upper layers while quilting those below. 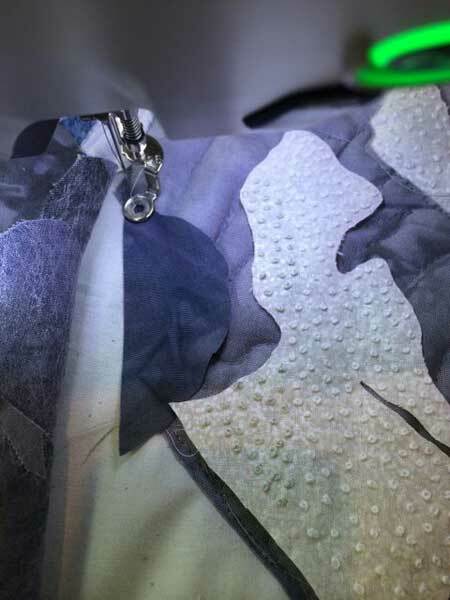 In the photo below, you can see the upper layers peeled back and the piece being quilted sitting a top the lower quilted layer. I coupled this “technique” with a decision to make the most of the pillowy base of the batting to create texture. One of the areas where I used this to great advantage was in the portrayal of the actual glacial flow of the glacier. 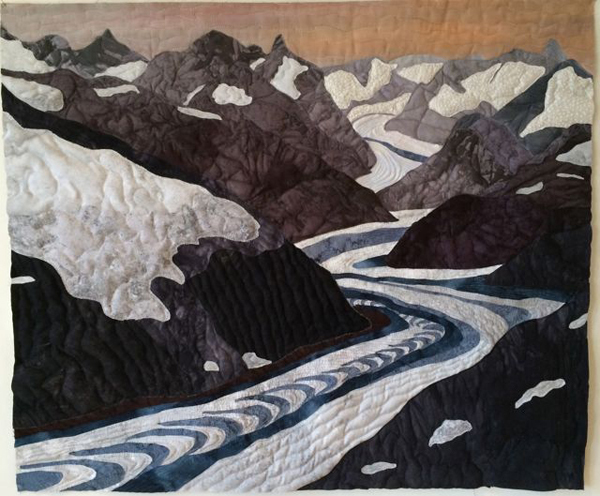 I totally enjoyed quilting Glacial Flow. 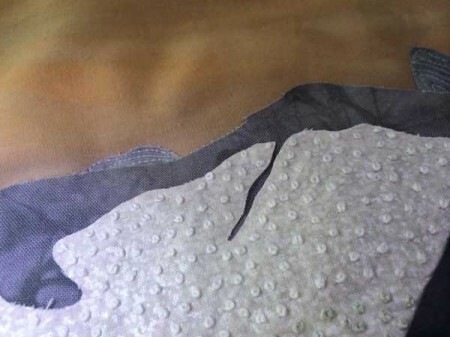 The fact that the fusing did not hold could easily have turned into a stressful situation. 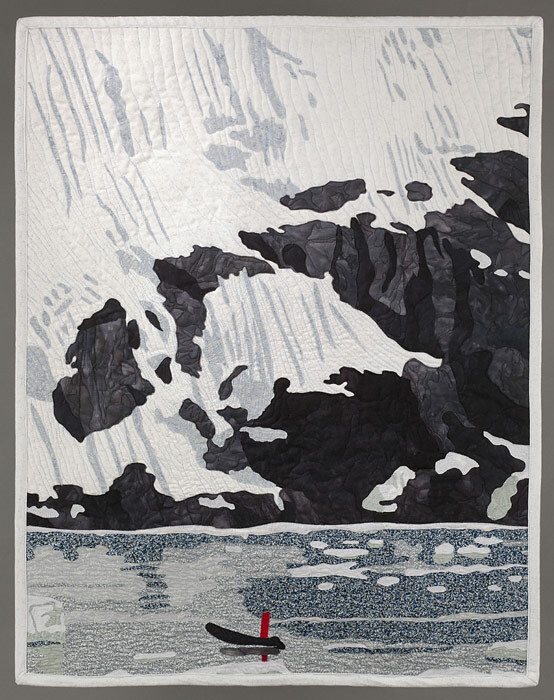 Instead, I chose to ‘go with the flow’ and look upon the interesting ‘landscape’ that I needed to quilt as an adventure. As you can see from the photo below, what I was dealing with was not your classic fused appliqué platform. 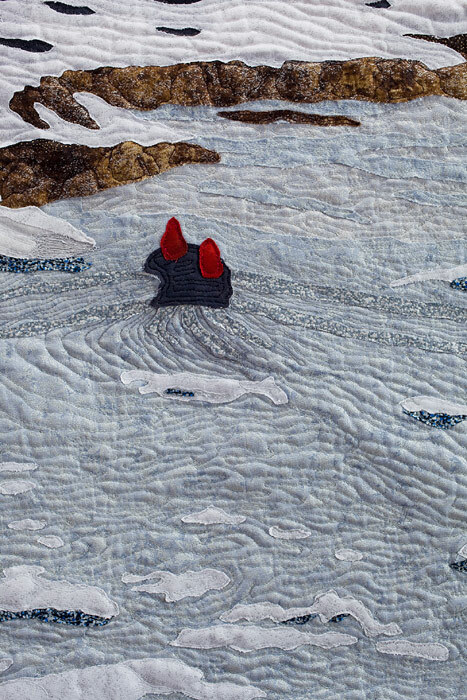 I got to a point when,where the fusing was still working, I purposely loosened it before stitching to readjust the layers and create the textural effect that was evolving with the quilting. 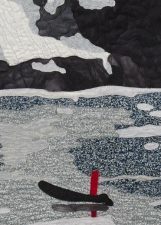 In all, the result was an art quilt that I am pleased with and now happily awaits facing. PS: Linking to Nine-Marie’s Off the Wall Friday.